« A serious internal condition – Pet medication can not solve it alone. The cat food compromise – is a new cat scratching post in order? You seem that you always have to “bargain” with your cat when it comes to his food. People are always fighting as to whether it’s best to feed him wet or dry food. 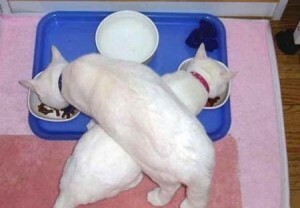 Some people say that wet food better mimics a cats natural diet. Because it contains more protein and water, it helps prevent dehydration and urine chrystals. Dry food doesn’t spoil as easily and may be a better way to prevent tarter and protect your cats’ teeth. So what do you do? Many veterinarians believe that the best thing to do is actually a compromise. No – it isn’t buying him a new cat toy or new cat scratching post. Feeding your cat both wet and dry food allows you to give your cat the best of both worlds. So now you could put the debate to rest and focus on providing plenty of water and food that best suits your cats lifestyle. Ask your veterinarian for a recommendation. I feed my cats a small can of wet food (which I split in half for two cats), then a bowl of dry food followed by a snack in the evening. It seems to work out just fine. If your cat is an indoor cat, I would suggest that you feed food that indicates “for indoor cats” on the package. You don’t want your cat to get too heavy! This entry was posted on Thursday, November 12th, 2009 at 7:12 pm	and is filed under Pet Supplies. You can follow any responses to this entry through the RSS 2.0 feed. You can skip to the end and leave a response. Pinging is currently not allowed.